Located in our separate garden annex building with views out to Mussel Point. 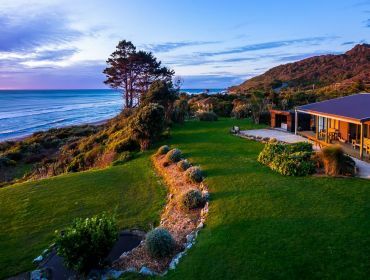 Large room, warmly decorated with NZ native timbers and beach stones with super-king bed positioned to make the most of the fabulous views. 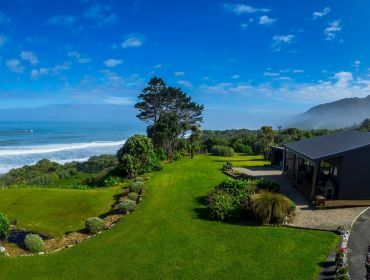 Entrance area opens into a wonderful large room, warmly decorated with NZ native timbers and beach stones with super-king bed positioned to make the most of the fabulous views. Super King bed and single bed so suitable for double, twin or triple occupancy (additional fees apply). Decorated in warm neutral tones in keeping with our beachfront location. Large ensuite bathroom with shower. A comfortable sitting area is provided looking out to sea and leading out on the deck. Sit back, relax and enjoy the fabulous sea views and the sounds of the sea. Rate for two people. Additional charges apply for third person (maximum occupancy three people). Rates include breakfast. 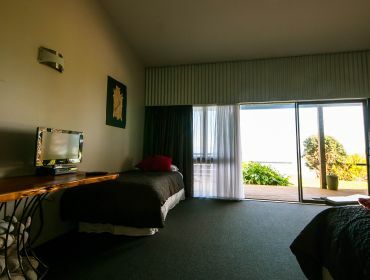 * Driftwood is also disabled friendly with wheelchair ramp access, large spacious room, and disabled bathroom facilities with slide shower and hand rails provided.